Before the Taliban takeover of Afghanistan, kites were a cheap toy for the poor children living there to construct and play with. However, there is one aspect to their kite games that you never see in America. These children would often coat the strings with jagged pieces of glass, and purposely fly them in aerial combat trying to cut the strings of each other’s kites. Each kite flyer has a “runner” who races to capture fallen kites, which become the property of the winner. One team of kite battlers is made up of Amir, the son of a wealthy and powerful local man, and Hassan, who is the son of their head servant. The question is, when violence, brutality and half a world of separation come between Amir and Hassan, can their friendship survive? Director Marc Forster really likes manipulate the contrast in his films, pushing the whites almost as far as they will go. As a result, in all honesty I feel the movie looks very over processed on the master digital intermediate. The Kite Runner was shot on a fairly low budget, and noise reduction appears to have been used for the purposes of consistency between shots – this isn’t manipulation done to make Blu-ray compression easier. Unfortunately, this high level of processing really affects the CGI kites. While the overall animation and design is quite beautiful, the choices made in color grading and processing really made them feel like they often weren’t actually part of the scene, breaking the fourth wall. If you can get past these factors, The Kite Runner Blu-ray offers a substantial upgrade over the DVD version. Unlike the video, the audio suffers neither stylistic or budgetary hang-ups. The Dolby TrueHD soundscape is constantly alive with the sonic textures of Kabul, and the sounds of so many people crammed together. This is not a slam-bang mix, but I’ve always felt that painting a scene sonically is one of the most underappreciated arts there is, and The Kite Runner is the rare gem of a film that gets it right. The Blu-ray extras replicate those of the DVD, with the exception that the trailer has been upgraded to high definition. Director Marc Foster, author Khaled Hosseini and screenwriter David Benioff all participate in a commentary track that I was positive would be dry, but actually contains a lot of solid information not only on the film but also the world in which it takes place. A short “making of” documentary is split into two parts, which cover first the novel and the screenplay adaptation and then the film’s production. You’ve seen these sort of documentaries a thousand times, so you’d probably get more out of spending your time with the commentary. 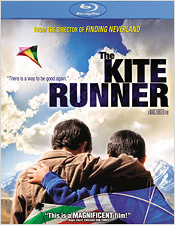 The Kite Runner is a painful and poignant film, that certainly doesn’t pull any punches and sticks closely to its source material. I’m glad to see that Paramount and DreamWorks are pushing more unlikely, but worthy, films out on Blu-ray Disc. Hopefully, those fans of Blu-ray who are tired of the usual action/adventure fare on the format will give it a try, and maybe learn something in the process.